BeenThere-DoneThat: Greenwich Park, Greenwich (3), London. Looking across Greenwich Park from the Old Royal Naval College to the Royal Observatory on the hill. 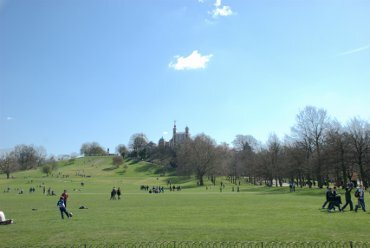 Greenwich Park covers 183 acres and is the oldest enclosed Royal Park. In the early 1600s, the park was laid out in the French style with many trees planted, some of which remain today. There is a good panoramic view of London to be had from around the Old Royal Observatory which includes the Old Royal Naval College, Canary Wharf, the Millenium Dome and a bit of the Thames. The Royal Observatory is one of the most important historic scientific sites in the world and is the home of Greenwich Mean Time and the Prime Meridian line. 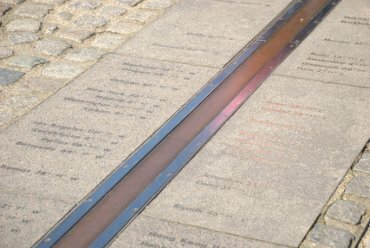 It was founded by Charles II in 1675 and is, by international decree, the official starting point for each new day, year and millennium (at the stroke of midnight GMT as measured from the Prime Meridian). 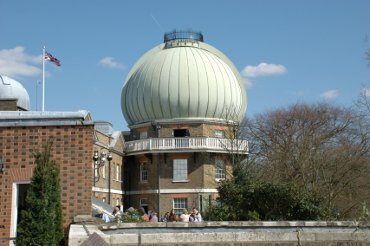 This dome houses the 28 inch refracting telescope, built in 1893, which is the largest of its kind in the UK and the seventh largest in the world. This is the Prime Meridian which is very popular with visitors who want to have their photograph taken with one foot in the eastern hemisphere and one foot in the western hemisphere. It is Longitude zero degrees. 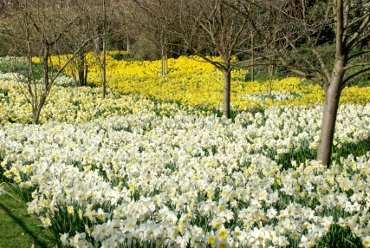 We were here in April which you might guess is Daffodil time but we didn't expect to see quite so many in one place. There are places in the park where you can get refreshments and there is also a bandstand where concerts are held on sundays during the summer.